In shades of green, blue, strawberry pink and white, your little one’s head will stay nice and warm with this adorable baby hat that is already made and available for immediate shipment. This rolled brim hat is perfect for a baby shower or newborn baby gift. Another one of the dessert series of hats from Daffodil Corner. 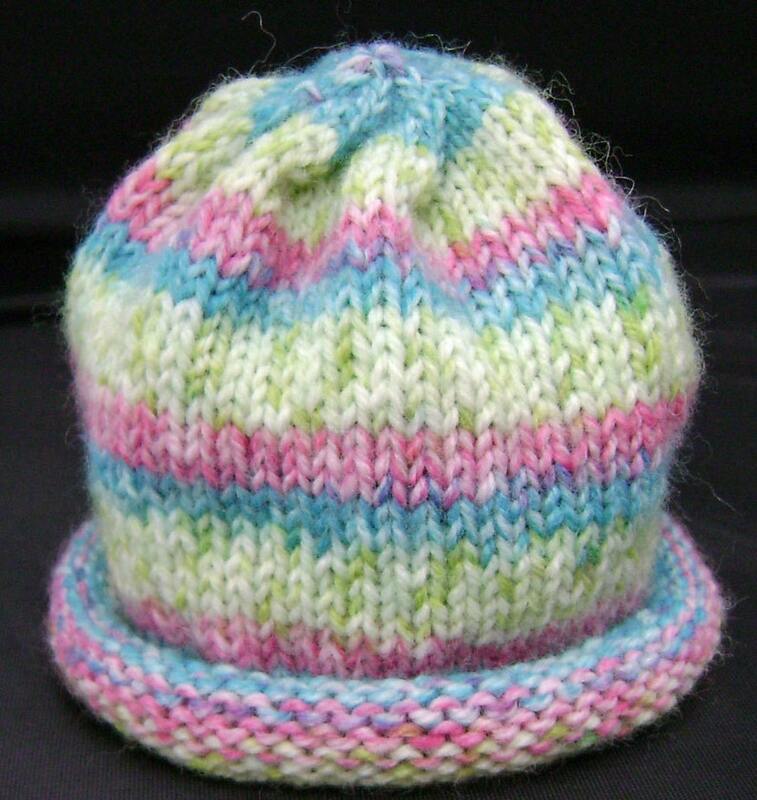 I used a soft, fine, self striping baby yarn made of a wool and acrylic blend, so the hat is warm but not too warm. I used circular needles, so there is no seam to irritate baby’s head. Soft and the hat measures 12 inches (30 ½ cm) around, and 6 inches (15 ¼ cm) from crown to the edge of the brim. This hat will fit a premie or small newborn baby’s head. The stockinette stitch I used makes the hat stretchy. Babies’ head sizes do vary greatly, so if in doubt, measure the circumference of the baby’s head. Handknit by me in a smoke free, pet friendly home. Other colors and sizes available by request (just convo me). Care instructions: hand wash in cold water. Do not twist. Reshape and allow to air dry. The hat will be shipped via USPS First Class Mail with delivery confirmation where available. Any duties or customs fees are the responsibility of the purchaser. I combine shipping to get you the best rate for multiple items purchased at the same time. Thanks for shopping at Daffodil Corner! I ordered this for my soon to arrive grand baby! It was easy to custom order and is beautifully made! Soo soft!! I can't wait to see my daughter's face when she receives it! Eileen's work is flawless !! She is my go-to for baby gifts. I loved these three beautiful snails - they were very well made, and arrived very quickly. Thank you so much! Love Love Love these! They are really bright and beautiful and wonderfully made! Thanks so much for the speedy delivery! If you chose to use Pay Pal’s E-check option, your purchased item will not be shipped until Pay Pal notifies me that the e-check has cleared. North Carolina residents will be charged sales tax, as will residents of those states that require sales tax to be remitted even if I am not located there. I hope the need for a refund is a last resort. I want you to be satisfied with your purchase from Daffodil Corner. If, for any reason, you are not satisfied, please contact me via Etsy conversation or e-mail to daffodilcornernc [!at] hotmail.com, and give me an opportunity to work with you. Creating a positive experience for my customers is very important to me. Refunds will only be issued (not to include shipping) if you return the item in question back to me. I will ship your item usually within 2 business days of cleared payment. If there is a postal holiday, an additional day may be required. If there is ever a delay, I will contact you to explain why. If you pay by e-check, your item will be shipped after your payment is received and has cleared the bank. In the case of a custom order, I will negotiate shipment date at the time of order. Shipping rates include postage and packaging. I do not make a profit on shipping, but I do cover my expenses, so shipping will be a bit more than the actual postage to cover the packaging materials. If there is ever a significant difference between what you are charged and the actual cost to me, I will refund you. If I mess up and the actual shipping is more than I charged you, I will pay it. In the case of multiple item orders, I combine shipping to get you the best rate. This may mean upgrading to USPS Priority Mail or USPS Flat Rate Priority Mail to get the best rates. Again, I will refund you should the combined shipping be significantly less than what you were charged. Discounts on multiple shipping apply to orders shipped to the same address only. Many of the items you find at Daffodil Corner weigh less than 13 ounces, and therefore can be shipped via USPS First Class Mail within the US. I would be happy to ship by another method if you would prefer, but you will need to contact me via Etsy conversation or e-mail to daffodilcornernc@hotmail.com to discuss options. If your total order weighs more than 13 ounces, I am required by USPS to use Priority Mail within the US. I do ship internationally. In an effort to keep your shipping costs low, I utilize USPS First Class International postage. There is limited delivery confirmation on USPS First Class International mail. If you have any questions about the cost for international shipping, or prefer a different shipping method, please contact me via Etsy conversation or e-mail to daffodilcornernc@hotmail.com to discuss options prior to purchase. Please realize that your package can take anywhere from days to weeks to reach you, depending upon where in the world you are located, and this is out of my control. I will send you the customs number when I ship, and you may be able to use this information to track your package’s progress. Please note that international buyers are responsible for any customs fees, duties and/or import taxes associated with their purchase. These fees are set by your country, not by the US. I do not routinely include a printed receipt, so please indicate in the comments to seller when you make your purchase if you require one. I prefer to save paper and not send a copy in the package, as you can print a receipt from Etsy or Pay Pal. Feedback on Etsy is optional, but I do appreciate receiving your feedback after you have received your item from Daffodil Corner. I want to know that it got to you, and that you are happy with it. I make every effort to respond to inquiries within 24 hours. You may contact me via Etsy conversation, or please feel free to email me at daffodilcornernc@hotmail.com with any questions or special requests. If for some reason you do not hear from me, please check your spam e-mail folder, or my announcement page (in case I am out of town without my laptop for a few days).